A flood of bearish news has pushed down oil prices to their lowest levels in months, with WTI nearing $45 per barrel and Brent flirting with sub-$50 territory. With a bear market back, there is pessimism throughout the oil markets. Goldman Sachs is even predicting oil stays at $50 through 2020, a profoundly grim view of the state of oil supplies. On the other hand, the contraction in U.S. shale is underway, so it is just a matter of time before the mismatch between supply and demand balances out. For several years, WTI, which tracks U.S. crude, has traded at a discount to the more internationally-oriented Brent crude marker. There were a few reasons for this. The U.S. saw a surge in oil production, a familiar story to anyone watching the energy space over the past few years. Importantly, however, was the fact that pipeline capacity could not keep up with production, causing localized gluts in certain areas of the United States. Also, the ban on oil exports kept oil stuck within U.S. borders. That also contributed to a lot of oil sloshing around in the U.S.
As a result, the gap between WTI and Brent opened up after historically trading in concert. WTI started selling for a few dollars cheaper per barrel, a discount that was most pronounced in 2012 and 2013. The spread has continued to wax and wane, narrowing more recently because of a build out in pipeline capacity in the U.S. 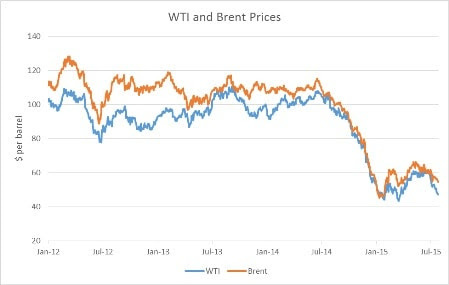 However, the WTI/Brent spread has shrunk more dramatically since the collapse in oil prices. That is simply due to the fact that global oil markets started experiencing a glut of supply across the world in 2014, a development no longer confined to the United States. WTI evenbriefly traded higher than Brent earlier this year, before the discount returned. Low oil prices will sooner or later force a cutback in production. Although EIA data is sketchy on this point, there is evidence that a contraction is already occurring. 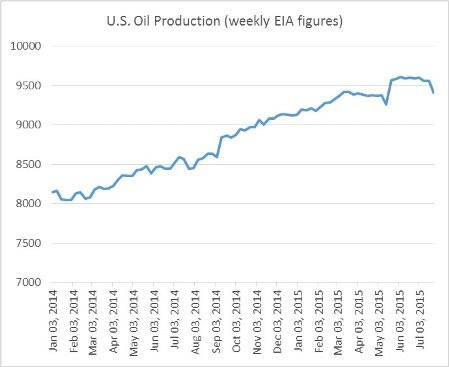 The weekly EIA figures are estimates, subject to inaccuracies. A retrospective look a few months later usually clarifies the data. However, even taking the most optimistic view of the data, U.S. oil production has flattened out at a minimum. More accurate monthly data shows that output likely peaked in March at 9.69 million barrels per day, falling to 9.51 million barrels per day in May (the latest month for which data is available). In other words, low oil prices are forcing production cut backs. More declines in output should be expected in the months ahead. Moody's expects more defaults in the oil and gas industry this year, as debt piles up and lenders cut off access to credit for drillers. "We expect that the energy sector will continue to be a primary driver of defaults over the next year," Moody's senior vice president, John Puchalla, said in astatement. Hedges are expiring, which have shielded profits up until now. Credit lines could be reduced, forcing liquidity crises for weaker companies. These developments could impact oil production overall. As a result, slowly and incrementally, U.S. oil production could decline enough to start to put a floor beneath oil prices. Interestingly, however, with non-market oil producers controlling a large portion of oil capacity around the world, the contraction of supply could disproportionately occur in the United States. Put another way, OPEC will continue to produce even though oil prices are low, but market actors in the U.S. won't be able to do the same. New Iranian oil will only magnify these differences. The result could be not only a narrowing of the WTI/Brent spread, but we may actually see WTI overtake Brent. That is the conclusion of a recent report from Bank of America, which predicts that WTI will trade at a premium to Brent in the spring of 2016. According Francisco Blanch, Bank of America's head of commodities in New York, the U.S. may resort to more oil imports, as oil from abroad suddenly becomes cheaper. "This combination of higher output from Persian Gulf producers and declining drilling activity in North America could well reverse WTI-Brent crude oil market dynamics next year," Blanch concluded in the report.